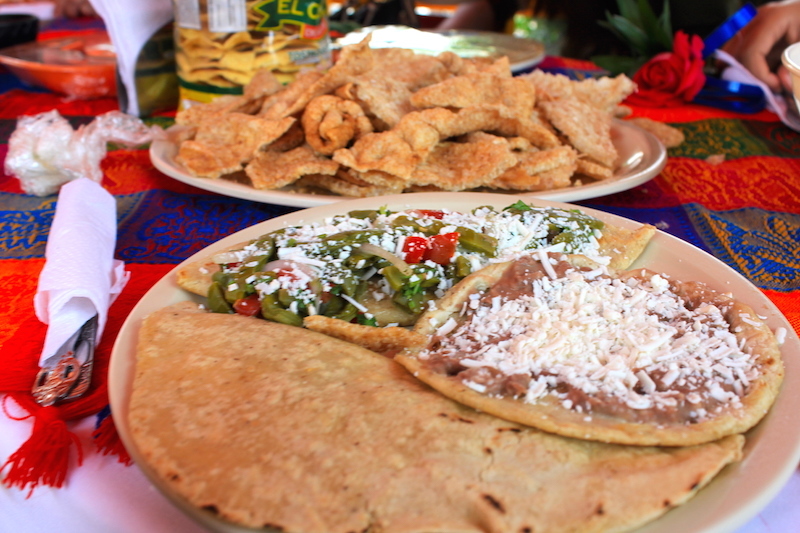 As you might have heard before, Mexicans are especially good when it comes to fiestas. 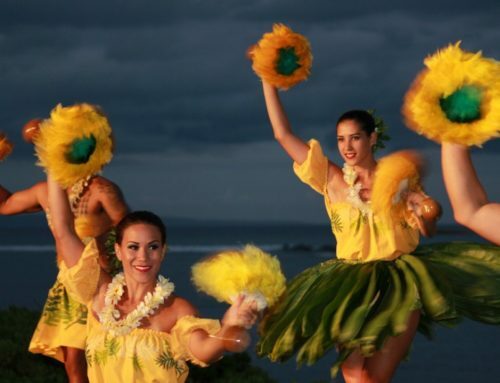 The party spirit runs through their souls–with just about anything requiring a full-blown celebration of dance, food and drinks. Mexico bursts with a vibrant colorful atmosphere that is, simply put, contagious. Now imagine this: there is a quintessential network of gorgeous canals that reflects a rainbow-like assortment of colors. Beautiful trajineras (gondolas) donned with unique names glide gracefully along the Xochimilco canals, with musicians, vendors, and a gleeful vibe all around. Honestly, going to Xochimilco is one of those things you have to do if you ever visit Mexico City. The Floating Gardens are insanely popular amongst tourists and locals, and for good reason! 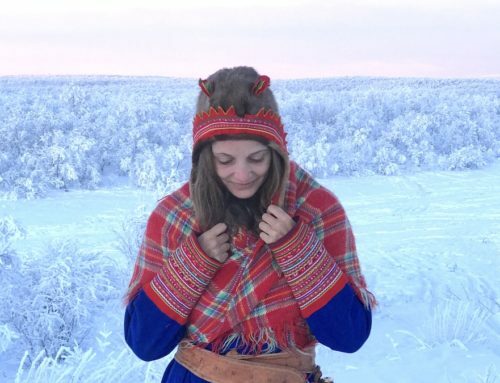 I can tell you from personal experience that this will be a once-in-a-lifetime kind of experience that is impossible to recreate anywhere else. 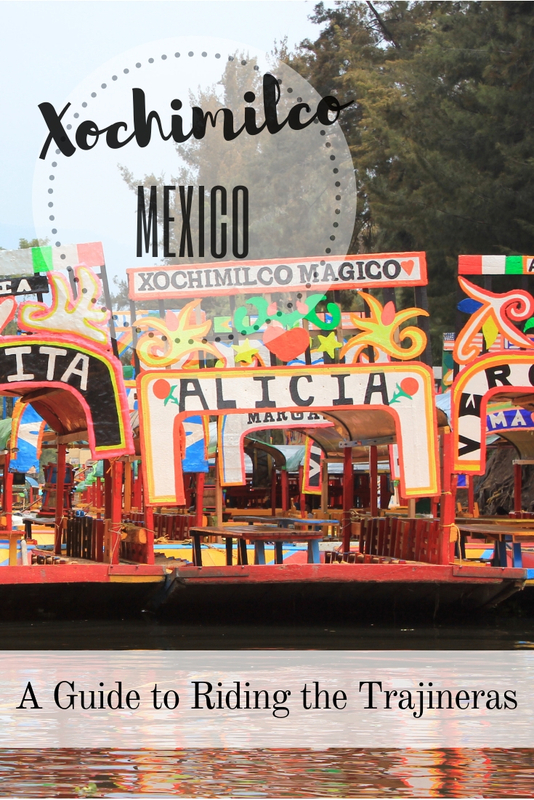 Xochimilco lies 17 miles south of Mexico City, and it is mostly known for it’s large body of floating gardens that run through a vast lake and create the popular Xochimilco canals! The gardens don’t really “float” per se, but they are only held together with a few roots of tree that are man-made through natural resources. The Xochimilco canals (Xochimilco directly translating to place where flowers grow) is a destination more than anything else—a Sunday escape, a floating fiesta of trajineras, a picnic and the Venice of the New World. The chinampas there (which are the floating gardens), are recognized as an UNESCO World Heritage site and are actually still used for cultivation up to this day. “Trajinar” which is a Spanish verb, directly translates to carrying goods from one place to another. And that’s originally what the “trajinera” boats were for. 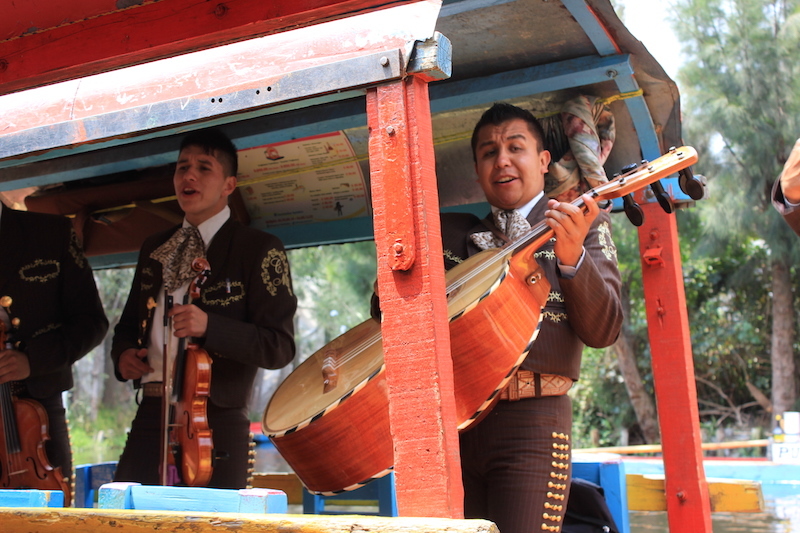 Porfirio Diaz, the former president of Mexico, used the “trajineras” to give guests a tour of the quintessential Xochimilco and it grew to become one of the main pastimes for Mexicans. Most trajineras seat as many as 20 people on wooden bench tables, but you can even find bigger ones, usually called lanchas colectivas that fit over 60 people. And although you can pretty much take a “trajinera” ride anytime, the best time to do so is during Sundays. This is the best way to experience it as a local. 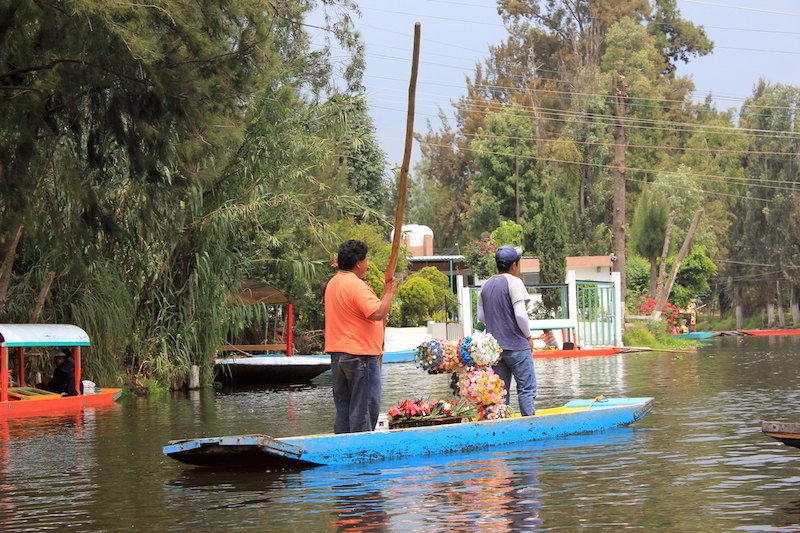 Arriving at the Xochimilco canals is like seeing an explosion of Skittle colors — a rainbow piñata of boats. Rows and rows of trajineras (gondolas), stacked back to back and side by side, waiting for hundred of passengers which would no doubt be arriving shortly. Each doned a unique name; Viva Lupita, Margarita, Carmelita—Ms. Julietta was the name of my ride. You know what a completely normal scene is like on the Xochimilco canals? Let me tell you what it was like for me. If you think the experience only entails being on a trajinera and gliding through quintessential greenery, then you’re wrong. The whole experience is a multi-sensory one where a lot of different stuff happens at the same time. A traditional family sing together, a passing group of rowdy young people, snacks all around, floating singing mariachis, floating taco stands, colorful ponchos and sombreros everywhere and much more (including photographers taking pictures of you!). Brightly colored gondolas, dozens of people, huge groups, good food and music—what more could you ask for? As you float down the canals back and forth, you’ll also get to pass boats that sell food, drinks and even souvenirs. I’m talking corn on the cob, sombreros and lots of beer! Honestly, if you ask me – it’s quite the picturesque way to spend your day. Instead of just going on your usual boat ride, you actually get a multi-sensory experience that everyone can enjoy. As we were on the boat, a lively mariachi band actually pulled up to our side and “serenaded” us with some good old Mexican folk music. Other vessels passed us along the way, some carrying families who were celebrating a members cumpleaños (birthday) and some packing college students enjoying a day away from studying. There was dancing, singing and laughing aboard them all. Plenty of canoes filled with vendors and souvenirs glided by, selling everything from blankets to flowers to libations. Of course, when you’ve been on a boat for a while, it’s hard to pass up a delicious Micheladas (a beer Bloody Mary) and elotes (grilled corn slathered in a creamy chili and lime sauce with cheese, it’s a classic Mexican street food or in this case ‘water food’). Though you can buy food on the water or bring your own, our lunch was catered by a local restaurant and brought on board prior to departure. Mariachis played in the background as we ate soft tortillas frilled with refried beans, peppers and cheese. A plate of very addictive chicharrones (fried pork rinds) was passed around and cervezas were plentiful. After you’re done on the water, return to the dock where souvenir shops in the mercado area wait. I skipped the shopping and headed straight for the the Danza de los Voladores (dance of the flyers) show that was happening in a courtyard nearby. 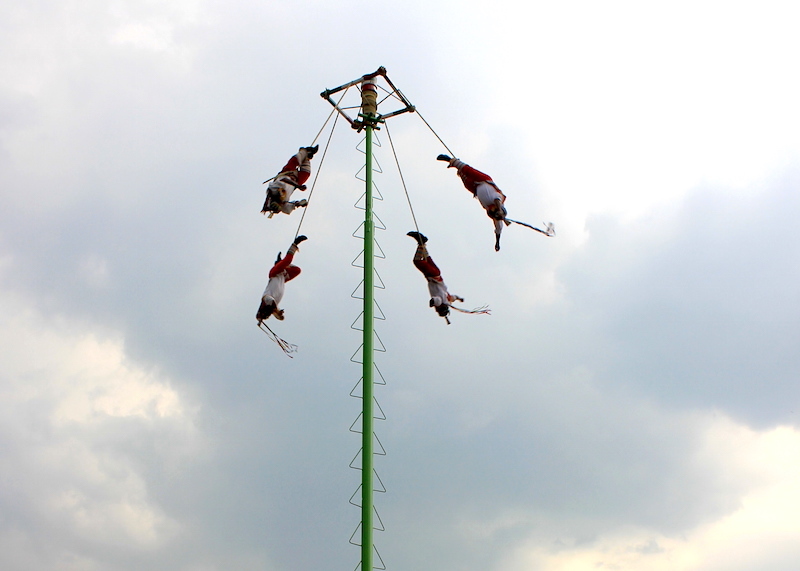 This Mesoamerican dance ceremony, consists of flyers climbing to the top of a 30-meter pole. Secured by ropes they then launch themselves to the ground, mesmerizingly spinning around the pole all the way to the bottom. I got dizzy just watching. 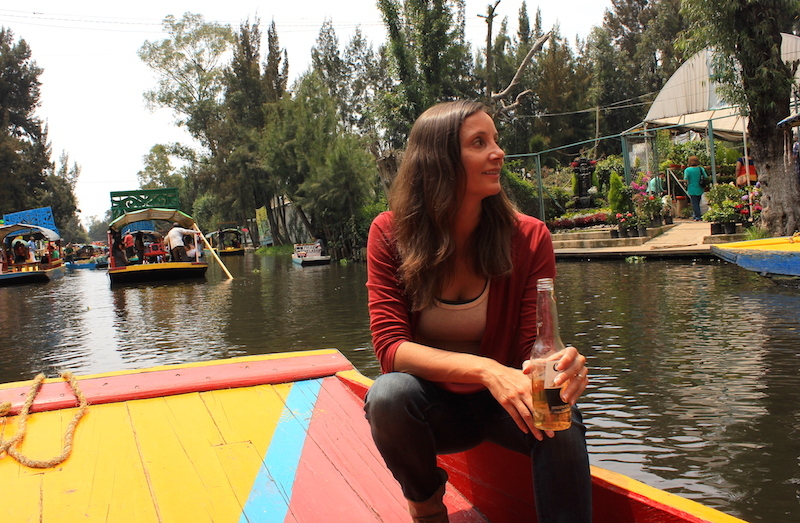 A trajinera trip along the Xochimilco Canals is, in my opinion, one of the best ways to actually experience the local life first-hand. You’ll get to see the eternal fiesta enjoyed by Mexicans all the time, and you’ll get to have a different type of sight-seeing other than normal guided tours. 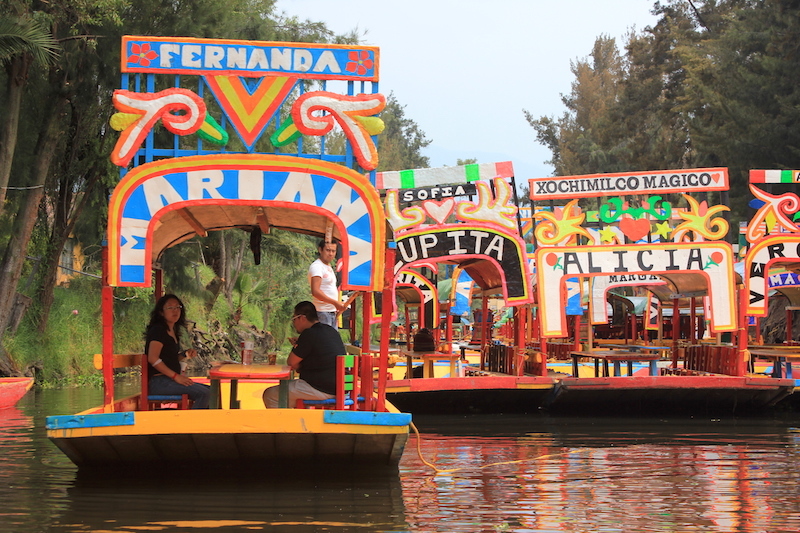 Xochimilco Canal Tours – You can take a tour with GetYourGuide that will take you through a tranquil boat trip along the water and a visit to Frida Kahlo’s house (Casa Azul). You’ll also get to explore the quaint streets of Coyocan after a hectic day on the water. There’s also another tour by Viator that will take you through the streets of Coyocan, the National Autonomas University of Mexico to see murals of Diego Rivera and more, go to the Frida Kahlo Museum, and then float on a trajinera down the Xochimilco canal! An expert guide will tell you all about the interesting history surrounding you. If you choose to find your own way to the Xochimilco Canals and not book a tour, you can negotiate with the boat owners upon arrival or arrange your trip through your hotel. If you do not make prior arrangements, arrive early as they tend to get very busy. A boat ride should cost around $500 Mexican pesos ($26 USD) per hour for the entire boat, not per person. What to Bring – You won’t need to bring much – just make sure you have cash. If you’re not wanting to spend money on food and drinks, then I recommend packing up on some snacks for the ride! Other things to do Nearby – To keep with the once-in-a-lifetime theme, my top recommendation is a visit to La Isla de las Muñecas. The Island of the Dolls is something straight out of a horror novel—an entire island dedicated to old dolls. There are hundreds of old dolls (deteriorating too) that are creepily hung over the trees. It’s no surprise that people actually think that this place is haunted. It can be quite crowded, especially on the weekends, so if you are looking for a more tranquil experience try visiting early in the morning on a weekday. It’s best to book the trajinera for at least two hours. This way you’ll be able to venture further away and explore more. Make sure you bring cash with you, they do not take credit cards. A trip is best enjoyed with a large and lively group! Pack a cooler full of beer and snacks if you can. Bring speakers! If can then liven up your gondola with your own music. Check out these portable travel speakers. Semana Santa, Holy Week, is definitely the busiest week of the year. 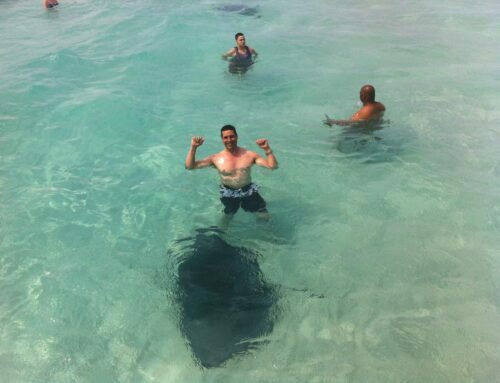 Swim With Whale Sharks. Cancun, Mexico. 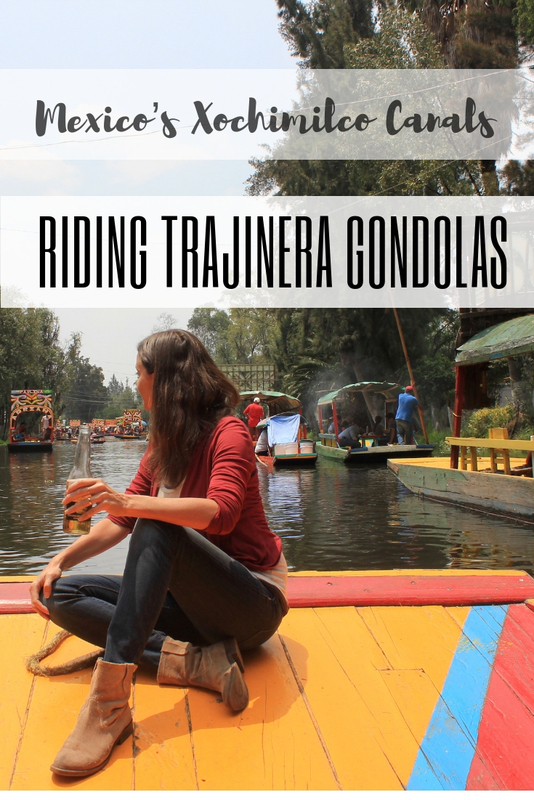 My trip to ride the trajineras in Xochimilco was hosted by Go Eat Give & Mexico City Tourism, but all opinions are my own. I agree, it’s hard to go wrong with music, food, booze ad good company! The first line of this article is the absolute perfect description of the gondolas! Speaking of, I love that each one has its own name. 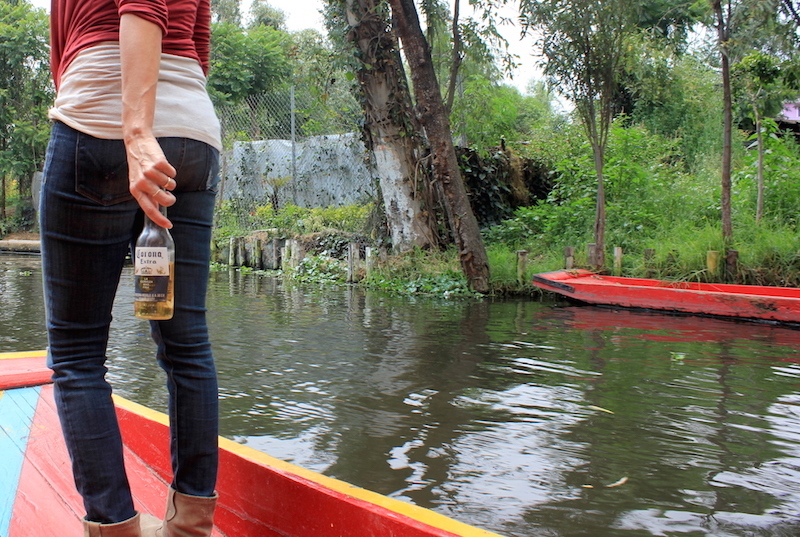 Looks like an amazing way to experience Mexico’s Xochimilco canals. I also loved that each one had a different name, especially because one was named after one of my dearest friends, Lupita! The borough is centered on the formerly independent city of Xochimilco, which was established on what was the southern shore of Lake Xochimilco in the pre-Hispanic period. Today, the borough consists of the eighteen “barrios” or neighborhoods of this city along with fourteen “pueblos” or villages that surround it, covering an area of 125 km2 (48 sq mi). While the borough is somewhat in the geographic center of the Federal District, it is considered to be “south” and has an identity separate from the historic center of Mexico City. 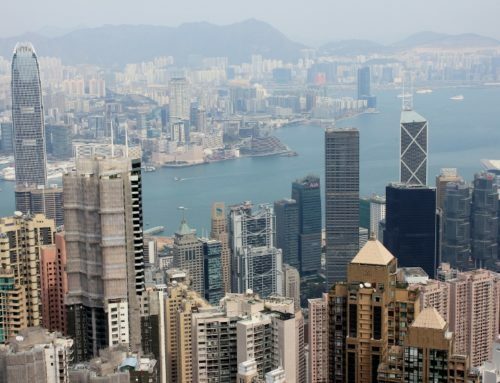 This is due to its historic separation from that city during most of its history. 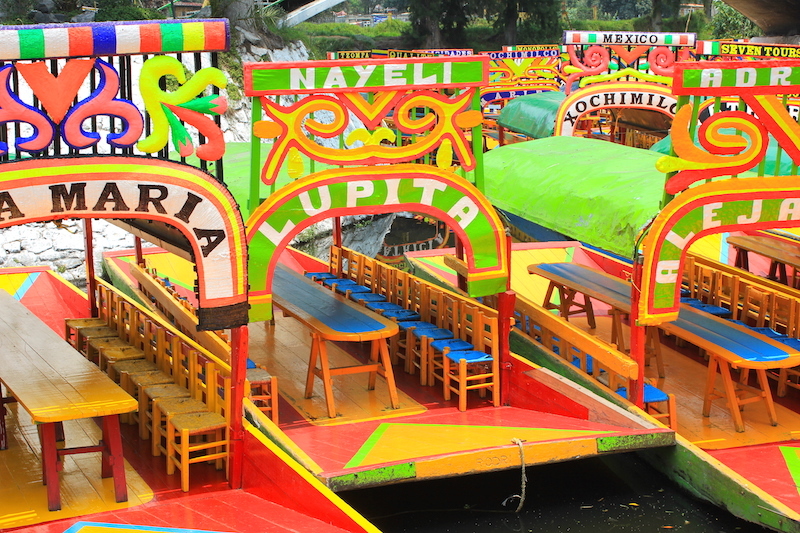 Xochimilco is best known for its canals, which are left from what was an extensive lake and canal system that connected most of the settlements of the Valley of Mexico. 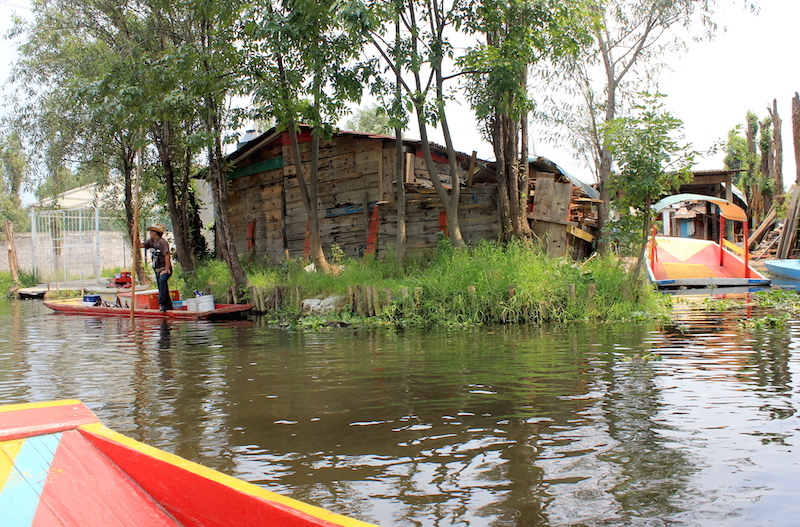 These canals, along with artificial islands called chinampas, attract tourists and other city residents to ride on colorful gondola-like boats called “trajineras” around the 170 km (110 mi) of canals. This canal and chinampa system, as a vestige of the area’s pre-Hispanic past, has made Xochimilco a World Heritage Site. In 1950, Paramahansa Yogananda in his celebrated classic Autobiography of a Yogi wrote that if there is a scenic beauty contest, Xochimilco will get the First Prize. 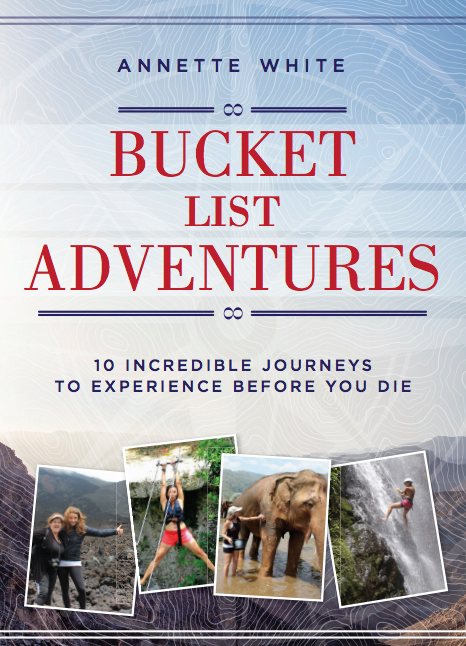 Great Blog listings, it is wonderful travel blog stories provide the best adventures for the Travellers. 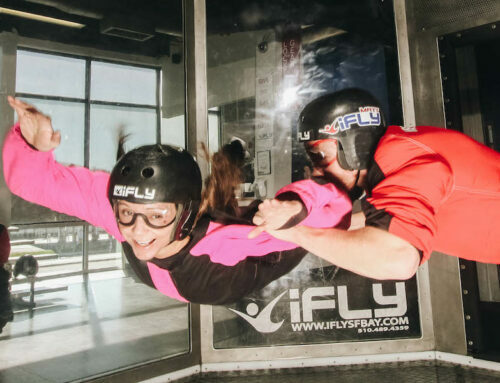 I have also want to travelling experience with the sensory deprivation. 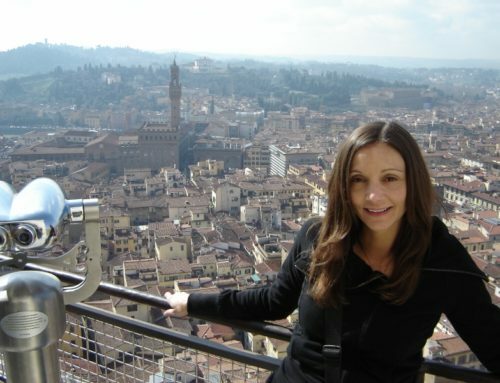 Thanks for the sharing the fantastic travel story i am inspire of this travelling. I did that tour last year with a group of friends and we loved the boats, atmosphere, music, flowers .. everything was so amazing and colorful. Reading your article brought back the memories of that great experience! Went yesterday afternoon with my girlfriend, a very good friend from back home in Canada (he flew in for the weekend to hang out while we live here for Nov 2018). We also had a new friend with us who we met in a shared co-working environment. 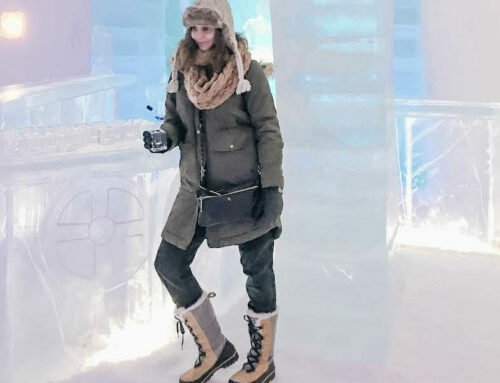 The experience was nothing short of magical. We had water food, michiladas, had a Mariachi band board our boat for three songs (a traditional song, a romantic song, and a rhythmic song). They were wild. Larger than life personalities. Gustav took us on a slow, meandering tour through this water-based community. Every house in the area has back or front yards that face onto/into the canal. Many cleaning, preparing, or repairing boats. Some serving or selling items. We did not realize until after we got on Fernanda that we could have rented a speaker / PA to blast party tunes while on the water. That said we had a perfect and amazing time regardless. There were point where we were surrounded by other boats and we dancing to their music, and there were parts where it was tranquil and quiet and still – truly beautiful. I can’t wait to go back. We saw pairs/couples, smaller, and bigger parties. You can make a go of it no matter the size of your party is. Oh also, on the way there in your car there will be gentlemen on scooters and bicycles who will tell you certain roads are closed etc. If you re driving the car just keep going to your Embarcado – you don’t need to follow their instructions and the roads are not closed. You have to do this. It was incredible. This is another experience I’ll have to add to my bucket list for when I get back to Mexico. I love all of the colorful pictures of the trajineras and the cultural experience this provides. best day to visit ? sat or sun ? Depends on what you are looking for. Sunday will be the liveliest, which also means more people than a Saturday.